Edit, Jan 16th 2013: You can now purchase a print of this comic over at Society6! Click the link and you will be taken there, as if by magic! Aww, I guess even Great Old Ones can get bored of the eternal waiting period before they can rule the world. I guess he got bored of L’iegho and Ech’sbochs isn’t there yet. Cthulhu with toys? Does this mean a bedroom crossover with glasses guy? ‘Cause, ya know…. tentacles! I heard it on some other pages that people didn’t really liked it back then when they were kids. I didn’t think it was bad, although still not as “flexible” as Lego (you couldn’t do to as much with it) but they are still pretty good toys. Would P’lyemobile characters have smiles on them, tho? Hmm, good point! Maybe Cthulhu would be happier if he got the P’lyehmobil set with terrified villagers instead. Saw the comic shared on a friend’s facebook and was curious about who made the comic. Found you easily enough, but man them taking credit for your work pissed me off. Yeah, this sort of thing happens all the time, unfortunately. At the very least they linked back to my site, and to their “defense” I think the placement of their stupid logo thing is automated. Meaning that I’ll probably have to watermark all my comics from now on with a semi-transparent layer with my URL, also spanning the entire length of the comic. I guess this process probably will render the comic completely unreadable, but ohwell! There is nothing about this comic that I don’t love. 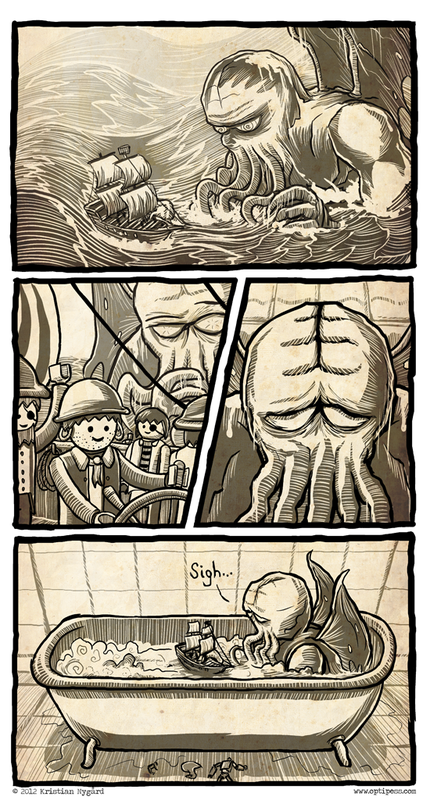 niiiice lol poor cthulhu. love your work, guy. Thanks! Another epicly sized Cthulhu-based comic is scheduled for posting soon-ish, so stay tuned for that! Someone posted this photo on Facebook with the copyright/credit/source intentionally cropped out at the bottom. This is why I hate the internet. But then it only took me five minutes of research to find the original, which is why I love the internet. Kristian – I’m in the US, but I would pay for a digital high-res of this that I could then print and frame (if a print weren’t available/for sale/able to ship to the US). This needs to be on my wall!